A common misconception is that if you are riding in a group that you can hide in the bunch – they will make you look good and cover for your inadequacies. WRONG! When bunch riding you are effectively ONE unit – like mountaineers roped together – on one hand you are safer and more efficient – on the other hand if one person buys trouble you all buy trouble and you are all more vulnerable to disaster. So you have to understand that the actions of one are the actions of the entire group; that if one person is not functioning properly the entire group is not functioning properly. Don’t let this put you off as all of us have to work at bunch riding and trust only comes with regular riding together. 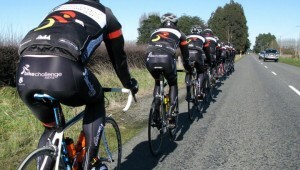 PURPOSE OF BUNCH RIDING – Why Cyclists Ride in Bunches. Drafting is an important technique in road cycling. The bicyclist, as he/she moves through the air, produces a turbulent wake behind them. It makes vortices. The vortices actually make a low pressure area behind the bicyclist and an area of wind that moves along with the bicyclist. If you’re a following a bicyclist and can move into the wind behind the front bicyclist, you can gain an advantage. The low pressure moves you forward and the eddies push you forward. Surprisingly drafting not only helps the bicyclist following the leader, but the lead cyclist gains an advantage as well. The interesting thing is by filling in the eddy of the front cyclist you improve the front person’s performance as well. So two people who are drafting can put out less energy than two individuals (who are not drafting) would covering the same distance in the same time. While the lead cyclist gains some advantage in this situation he or she still needs to expend much more energy than the cyclist who is following. In road racing, bicyclists group together in a pack known as the “peloton” or a pace line ( in a side wind situation) called an “echelon.” Cyclists who are part of the group can save up to 40 percent in energy expenditures over a cyclist who is not drafting with the group. To be effective drafting, a cyclist needs to be as close as possible to the bicycle in front of him. Many professional cyclists get within inches of the bicycle in front of them. The shorter the distance the larger the decrease in wind resistance.